This is an odd review because I haven't read this book to a kid. now lets you raise chickens, so this book seemed timely. There must be kids out there fascinated by dog/chicken behavior, right? 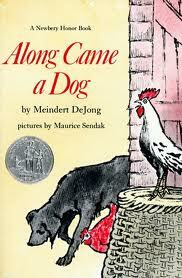 and illustrated by Maurice Sendak. her owner, and a stray dog looking for a home. and human misunderstanding of same. one animal death (the bossy rooster). or if your child has trouble visualizing characters. poultry farm. The hen wants a family of chicks. The dog, as previously mentioned, wants a home. real animals, while remaining lovable companions. reality may have special value for kids with autism. In How to Be Human, Florida Frenz chronicles her journey figuring out how to read facial expressions, how to make friends, how to juggle all the social cues that make school feel like a complicated maze. Diagnosed with autism as a two-year-old, Florida is now an articulate 15-year-old whose explorations into how kids make friends, what popularity means, how to handle peer pressure will resonate with any pre-teen. For those wondering what it's like inside an autistic child's head, Florida's book provides amazing insight and understanding. Reading how she learns how to be human makes us all feel a little less alien. A teenage author addresses others with autism with a mix of expressive drawings and insights from her own experiences intended to help “give your brain the right tools to reconfigure its hardware.”. . .Frenz has received enviable quantities of parental and professional support from kindergarten on. Still, she’s the one who had to do the work of figuring out how to make her way in the world, and readers with or seeking to understand autism will find her matter-of-fact observations both savvy and easy to absorb. Florida Frenz is the pen name of a high school student who kept a journal as a tool to figure out her emotions and how to read those of others. Diagnosed as retarded and autistic when she was two, Frenz worked intensively for many years with a team of autism and educational specialists. She's succeeded so well that in her new high school, she isn't identified as autistic or special needs and is even taking Advanced Placement classes. This book has not yet been released, you can pre-order it at a discount here. This post comes by way of Twitter and The Autism Treatment Directory-I know nothing about the book or the method, but using play for child development always gets my attention. Replays addresses the challenging behaviors of children with autism spectrum disorders through interactive symbolic play. It shows parents and professionals how to help children access their emotions, whether the child is verbal or not, cognitively able or impaired, even-tempered or volatile. The chapters introduce and show readers how to implement Replays, and describe ways of adapting this intervention to address specific issues in different settings and circumstances. Levine and Chedd present more than just behavioral management strategies in the context of social, emotional and communication development: they have developed a technique that helps children to re-experience, play through and master the complex emotional response states that often lead to ongoing behavioral challenges. Replays is an easy and fun tool that provides numerous step-by-step examples and illustrations. It enables parents and professionals to guide children with autism spectrum disorders towards mastering, and changing, their emotional and behavioral responses. If you're interested, click here for more information. Today's book review comes (with permission-thank you!) from the blog New to Homeschooling/Not New to Autism. Homeschoolers, do NOT let the title turn you off. 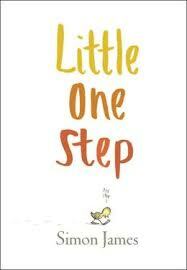 You'll like this book, too, if you have a challenging child. 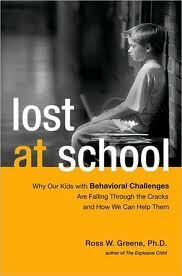 Chapter 2 of Lost at School, Why Our Kids with Behavioral Challenges Are Falling Through the Cracks and How We Can Help Them, by Ross W Greene, Ph.D. is titled, "Kids Do Well If They Can." On page 10, the opening page of Chapter 2, Green explains that, "When the 'kids do well if they want to' philosophy is applied to a child who is not doing well, then we believe that the reason he's not doing well is because he doesn't want to." A paragraph later, Dr. Green continues, "By contrast, the 'kids do well if they can' philosophy carries the assumption that if a kid could do well he would do well. If he's not doing well, he must be lacking the skills needed to respond to life's challenges in an adaptive way. ..."
What are those skills? Interestingly, they are pretty much the same concepts, described in new ways, as the skills we are working on in RDI(r) as we work to remediate the core deficits of autism, skills like attention shifting and attention sharing, in what we sometimes refer to as "social skills", and in flexibility and creative problem solving. That's just a short list. Dr. Green has created a checklist of lagging skills he calls the ALSUP, or Lagging Skills and Unsolved Problems (ALSUP) . During a November presentation, he told those of us in attendance that this document is a work in process, and that he will update it periodically, and he told us that it is available on the book web site. The "lost at school" web site is here. Click here for the ALSUP in PDF. Dr. Green walks a parent and/or professional through the process of gaining the trust of the student, and he teaches you about CPS, or Collaborative Problem Solving, a process that gives the student an opportunity to practice and grow the very skills that are lagging in a way that the child is a very active part of the process. RDIers will like this book--the ideas fit nicely with what we're doing in "guided participation" applied to autism. I see a lot of similarity with Feuerstein's "MLE" (mediated learning experience), too. I like the way Dr. Greene writes -- the book is filled with anecdotes to illustrate his points. Those of you who know me know that I am a huge fan of our public library and the service our libraries offer called interlibrary loan. I often borrow a book in order to preview it, to decide if I like it enough to buy it. This one, I bought sight unseen, on a recommendation from another parent, and I'm glad I did, and this time, I am going to suggest you buy this one, because you're going to want to read it with a pencil or highlighter in one hand. ;) And if you get an opportunity to hear Dr. Greene in person, GO! He is a fantastic speaker! This post originally appeared here where you can find other posts by the reviewer. it hard to believe I haven't written about it yet. a short (very short) trail with pages from a book posted at intervals along the path (for those familiar with Warner Park trails, it's on Little Acorn). pieces. Both boys enjoyed seeing it again on the trail. which your kids may enjoy, that describes how people construct indoor animal habitats. Web searching this title yields cool results. Brian would catch insects for the salamander. Brian found an orange salamander. He’d sleep in a salamander bed. 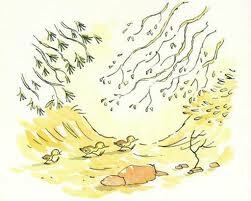 He’d slide in wet leaves and climb up the tree. Birds will fly from the ceiling to the sky. Ferns will grow under Brian’s bed. Brian will sleep outside and next to the salamander. 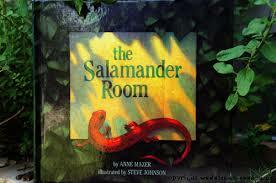 Every part of the salamander story was good in the story walk. I like the ponds the frogs will live in. No one has ever climbed trees inside a house before. Sleeping in an outside bed is exciting. If you slept there, you would be closer to the crickets and owls. May your June be full of nature's magic. *if lots of people use this link to buy it, amazon may give me a gift card. Not holding my breath, but thought you should know.